Tuesday night's 100-99 win over the Oklahoma City Thunder was one of the more exciting wins of the season for the Boston Celtics. The team somehow found a way to claim victory after being down by five points with just 17 seconds left in the game. 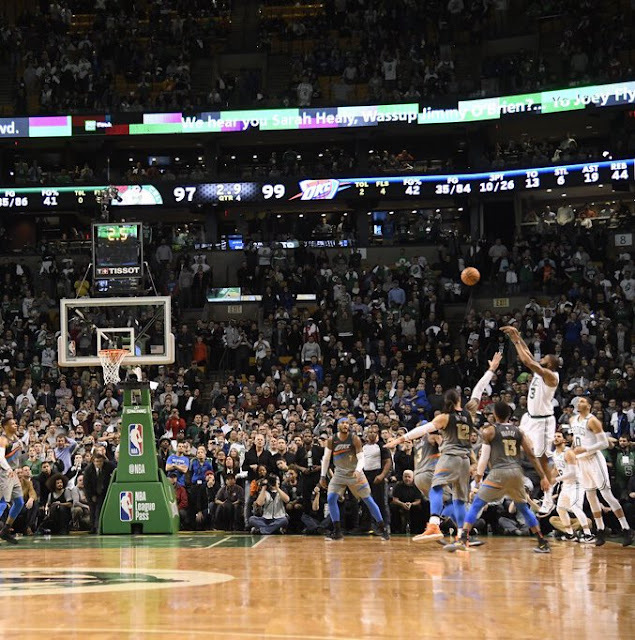 A few Carmelo Anthony missed free-throws certainly helped their cause, but the major play that turned the tables was the last second three-pointer by Marcus Morris. I'm sure many Cs' fans are still riding the big-win-high that Mook provided us, but some recently released information from the NBA may have us sinking back to earth faster than expected. NBA’s Last 2 Minute Report from last night says Marcus Morris should have been called for a 5-second violation before final inbounds pass, and that he traveled before hitting his game-winning 3. Also, enhanced video showed Terry Rozier traveled twice. No missed violations on OKC. Here's the footage. Check it out for yourself. Did Mook get the inbound in on time? Did he travel before the game-winner? I timed the inbound five times, beginning the clock right when Jayson Tatum turns his head and begins to cut and ending it when the ball leaves Mook's hands. Each time, the stopwatch showed a time in-between 4.20 seconds and 4.60 seconds, and that's with my exceptional inner clock. Let me tell you something NBA: You're suspect! I think the travel call is bologna too. The Last Two Minute Report says that he moved his pivot foot before the dribble, but I'm not so sure. In real time and frame-by-frame, it looks like he takes a dribble as he side-steps to get the open shot. That's not even a biased opinion. I truly don't see a travel there. If anyone can explain to me where the violation is, then please let me know in the comment section. Even if Morris did make those two infractions in the game's final seconds, the Celtics still got the W. That's set in stone, and is all that matters. It's too late to change the game's outcome, so ha! Take that NBA!